• Authentic Spanish flamenco music and dance performed by Siempre Flamenco. • Fine wine presented by knowledgeable sommeliers, who will be there to unlock the secrets of Spanish wines, especially the sherry and brandy for which Spain is famous. • Delicious food prepared by Gainesville’s own Adam Fehrenbacher, as well as other talented and passionate local chefs. In addition to signature Spanish foods, guests will experience the big reveal of the 2018 Culinary Festival lineup, as well as the event’s official poster. You’ll also have the opportunity to bring home a piece of Ocala Culinary history in the form of event posters signed by the artist, with a portion of the proceeds going to the Marion County Cultural Alliance. It gets even better: there’s only a one-time ticket fee, leaving you free to sample and taste without ever reaching for your wallet. So come on out and support your local artistic community while indulging in a unique culinary experience you won’t find anywhere else! 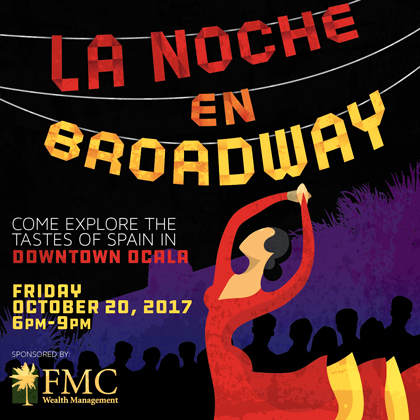 La Noche en Broadway will take place Friday, October 20th from 6 PM-9 PM in front of Brick City For the Arts. Tickets to this all-inclusive event are $75 per person. Get yours before they’re gone! To learn more about La Noche en Broadway, the upcoming Ocala Culinary Festival, and how you can be involved, visit the Ocala Culinary Festival’s website at www.ocalaculinaryfestival.com. For more on how you can help support Marion County’s vibrant artistic and cultural community, visit the Marion County Cultural Alliance at www.mcaocala.com.